We collect yarn. 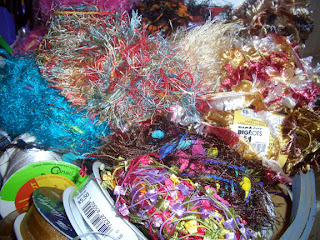 Our most exciting time collecting yarn, was when the local Big Lots sold yarn for $1 a skein. No kidding! The same yarn was being sold at the next door Hobby Lobby for $6 a skein and more! We also collect paper. 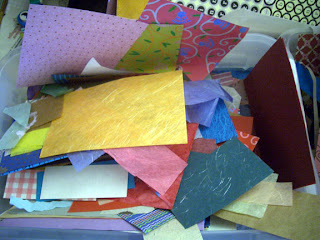 Obviously paper is the prime ingredient in decoupage, which is a favorite of ours. We have found paper at lots of sources. Our favorite for unique and interesting papers, but perhaps the most expensive, is Two Hands Paperie in Boulder. But our best deals have been found at Oriental Trading Company. Who knew-- they carry paper! with letters. It wasn't hard to convince her, since we both studied English in college.) We collect all types of letters. Letter stickers (note the upper right hand corner of the paper photo), letter paper, letter tiles, chip board letters, and letter stamps. Our most recent, exciti ng find came from the Target dollar section. You would never believe what you can find there. And being the thrifty gals that we are, we jumped on the opportunity! 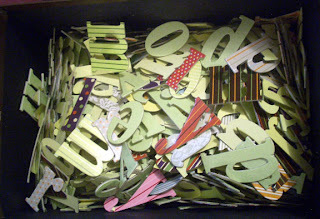 We found packages of cardboard letters--they came in colors, patterns and even sparkly green. They were just $1 per package! 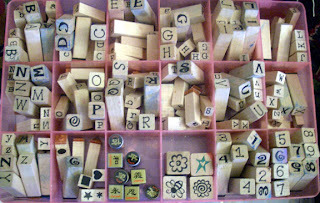 And if you have done any scrapbooking or letter-related projects, you know what a deal that was. What collections do you have for your art projects? How do you keep them organized? Sometimes that's the biggest challenge of all! We have visitors and friends come to the studio on a pretty regular basis, so we need to display our jewelry and other art items in a pleasing way. We have tried lots of different ways to provide an appealing presentation. So far, our latest is my favorite. 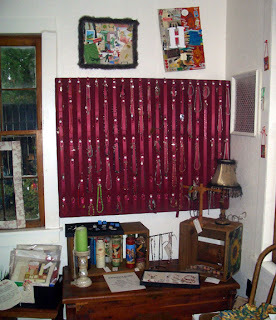 On the wall we mounted a jewelry display board. This is actually a re-purposed item. This is the top of an old drafting table. We disassembled the table, wrapped the top in batting and then a burgundy fabric. With a coordinating ribbon, and upholstery tacks, we make loops from which we could hang our necklaces and earrings. It has been a useful fixture i n the studio. Just this summer, we mounted the display on the wall, rather than using the table stand. Below we have an old cedar chest and some bookshelves to hold our candles, a lamp from our friend Linda, and our clearance items. Above, we hung our F and H collages. Another of our display pieces is the bakers rack. We found the bakers rack at a local flea market. We spray painted the metal portions black and changed the knobs. We use the bottom portion to hold our art and craft library. The drawers hold pouches and small fabric items we've made. The upper portions hold various jewelry displays, including my favorite wood ones that Kerry's dad made for us. Our other challenge is to be able to sort and contain all our our art materials, supplies and tools. That will be the topic of another blog....stay tuned. When people come into our studio, there is a lot to look at. It is a small space, but there is a lot of visual stimulation. We kept the walls and the ceiling white to create a blank canvas for all the rest of the items that you can see when you visit. Looking up, you can see our newly installed ceiling. There is a half loft for storage, but the rest of the ceiling is vaulted. Raw wood beams cross the span of the building. We uses these beams as display for various folk art, dolls and toys that my mom had collected throughout her years. It is always fun when someone walks in, looks up and notices all the interesting pi eces we have displayed. 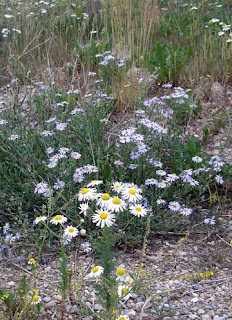 Here are just a couple of photos for you to see. The red boots that you see on on our blog hang from these rafters, too. The boots are the one item we never moved in our renovation of the studio. Kerry explained in an earlier blog, that we don't really know why they were put there, but they have become a icon the studio. 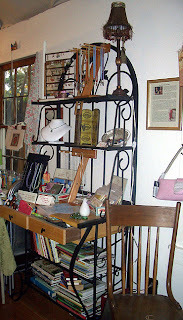 I am cleaning up my sewing room--which is not part of our studio. It is actually my guest room. And the fabric, ribbon, and sewing machine strewn about are not conducive to having my aunt and uncle stay with us next week. And because I am the procrastinator that I am, I decided to take a "cleaning break" and do this blog. Last spring, as I was trying to organize the materials in my sewing room, I searched around the house for a ribbon organizer. I had an idea. 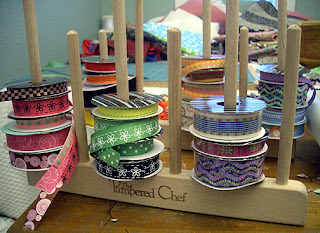 Why not use my old Stoneware Rack from Pampered Chef as a ribbon holder? It sits neatly on a table. It holds each ribbon spool in place. It is even pretty to look at. It is a tidy way of keeping potentially unruly materials in place. I love the idea of re-purposing unused items for other uses. What interesting things do you use in your house to keep yourself organized? Today we were listed on the SheFinds Blog about their Shop for the Cure fundraiser for ovarian cancer research. 20% from the sale of our two designs will benefit the Ovarian Cancer Research Fund. Take a look at the SheFinds Blog to find out about all the wonderful artists participating in this worthwhile fundraiser. "Don't you remember my middle name???" I exclaimed in the studio. "It's Nicholson!!! That is entirely too long." Thankfully I was given a reprieve and allowed to use my maiden official middle name of 'Ann.' Much more reasonable for a writing procrastinator like myself. So many words pop into mind...annoying, anxious, alienating, aggressive.....Oh enough self-loathing for the moment. Let's start again artistic, Aquarian, ambitious, active. They all apply it just depends on the day. As for the N's. Let's just say Naughty or Nice. It depends on the day. Well, we have been tagged, so kindly, by Amy. Here are the rules of the game: Players, you must list one fact that is somehow relevant to your life for each letter of your middle name. If you don’t have a middle name, use the middle name you would have liked to have had. When you are tagged you need to write your own blog post containing your own middle name game facts. At the end of your blog post, you need to choose one person for each letter of your middle name to tag. Don’t forget to leave them a comment telling them they’re tagged, and to read your blog. M - Making Things. I love making things. Arts, crafts, cooking, baking, gardening. You name it. Although now that I have said that, it all sounds a bit too Martha. I like to make things, sometimes I am not as proficient at all of the things I want to do. A - Art. I love art. I love going to museums, looking in galleries and shopping in art boutiques. I have lots of art on the walls of my home. I guess I had no choice but to love art with both of my parents art majors and artists themselves. R - Reading. I love to read. (an English major and former high school English teacher) Unfortunately, I don't make enough time for it in my life. I - Interesting Ideas. I really like coming up with ideas, whether it is a detail for an art project or a children's birthday party, I like to keep things interesting. E - Entertaining. I love throwing a party! I know it sounds silly, but I love to have people over for a small dinner or great big bash. I like the planning, the prep work, the details. I don't even mind the clean-up. Okay, that's me. Now I have to tag some other people. I hope they are in the mood to play along. Forgive me if you're not. So, I will tag my blogland friends: Rick the Palm Springs Savant, Tiffany Jane from Beyond the Vintage Path, and my new friends Heidi from The Wise 5, Lia from Art Junk Girl and Amy from Abundant Curiosities. Kerry will take her turn later this week. editors note: Amy from Abundant Curiosities was recently tagged, so I will add Brandy from Brandywine Boutique. It occurred to me that we should give you a studio tour. So, here is the first installment. This is the outside of the studio. It is a one room building in my (Rachel's) back yard. To the best of my knowledge, it was build at the same time as the house, in 1890. 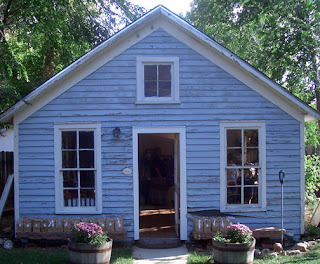 Kerry so eloquently wrote about our studio last March in this blog. But I don't think that we have given you a visual tour. Kerry and I hosted a garden party last Saturday. We decided to have the party primarily to launch our new line of jewelry. We also wanted to thank our former customers for their past business. And, we both enjoy throwing parties. We tried to think of all the details that would make that evening special: printed invitations, candles, decorations, wine, nice cheese, and of course, goodie bags. 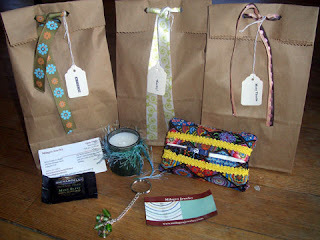 We filled each "Swag bag" with handcrafted items. Kerry painstakingly cut, folded, h ole-punched and tied each bag. We choose the familiar brown paper bag for our container, that way we could spend more on the contents. 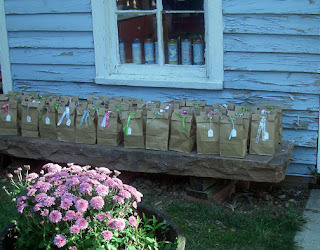 Each bag was tied with a colorful, printed ribbon and had a hand stamped tag to express a wish. All in all, the bags were an interesting addition to our decor. Hopefully each guest enjoyed the things we put inside, too. 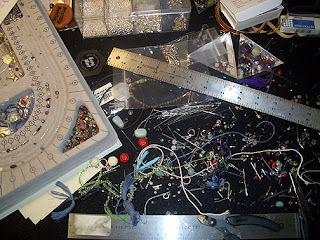 My messy work bench is a sign of high productivity and sophistication! In fact the TimesOnline (UK) reports, "Do tidy desks mean efficient workers, as the corporate mavens would have us believe? Not according to Abrahamson’s research: “People who said they keep a ‘very neat’ desk spend an average of 36% more time looking for things at work than people who said they keep a ‘fairly messy’ desk.” " Citing a book called A Perfect Mess: The Hidden Benefits of Disorder — How Crammed Closets, Cluttered Offices and On-the-Fly Planning Make the World a Better Place by Eric Abrahamson, who is a professor of management at Columbia Business School, the article goes on to say, "Order and uniformity are the enemies of those serendipitous random connections that can be priceless." Nevertheless, my perfect mess will be picked up in time for guests on Saturday! 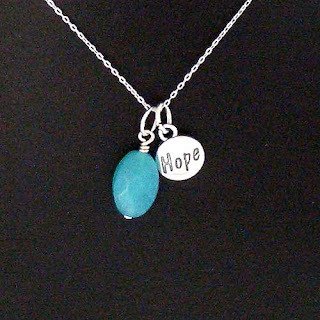 The color teal and the word "Hope" were chosen as the recognizable symbols of the Ovarian Cancer cause. We encorporate these into our "Your Word" jewelry line, where we ask you to choose your words carefully: Words are powerful! They can profess love, start wars, calm a crying baby or evoke tears. Choose the word necklace that speaks to you and tells everyone what you want to say. 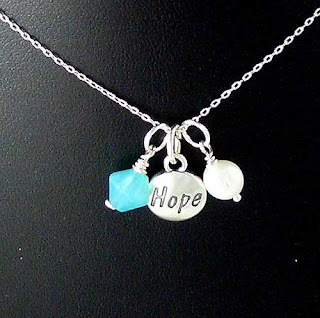 20% of the purchase price of out two necklaces will be donated to the Ovarian Cancer Research Fund. Find a link to the first design, here. And the second one here. The fundraiser is sponsored by SheFinds. According to the Ovarian Cancer Research Fund, Ovarian cancer is the leading cause of death from gynecologic cancers in the US and fifth leading cause of all cancer deaths among US women. A woman's risk of ovarian cancer is 1 in 67. 22,430 women will be diagnosed with it this year; 15,280 will die from it, and only 50% will survive longer than 5 years. As with any cancer, they say that early detection is the key to successful treatment. If diagnosed in the early stages, ovarian cancer patients have a five year survival rate of 90%. The signs and symptoms of this cancer are easy to overlook. What can you do? Become aware, be informed and listen to your body. We can't do a lot, but Kerry and I are participating in a SheFinds.com, Shop for the Cure fundraiser. We have designed two necklaces to honor and support the research being done in this field. Check back tomorrow to see our designs.